The Library of Congress Digital Collections website is a great resource for printables. 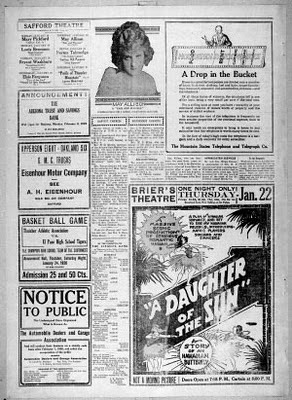 If you're looking for an old newspaper for your attic or historical setting, try their Chronicaling America newspaper database. You'll find downloadable, high resolution pictures of front and inside pages of American newspapers from 1860 - 1922. These are in the public domain. To make your newspapers look old, try Nikki's tips on aging paper on her blog, Miniature Question and Answer. Or, if you'd like some practice with Photoshop, try my step-by-step tutorial on aging newspapers. Enjoy! Muy buena información. Muchas gracias. Carol, you are GREAT !!!!! thanks! many thanks! You know where I can also find antique Italian newspapers?? Thanks Carol!Fantastic newspaper web site! I'll try to make one....I hope to have a good result! Carol, you always share with us such great info. Thank you so much! I love old newspapers...and old printings.